The Corby Town supporters and, indeed, the manager, have already stolen my thunder on this one but I am glad we are all in agreement! There really is no better sight than seeing someone really enjoying playing the game he loves. And that’s what strikes me the most about young Jordon Crawford. 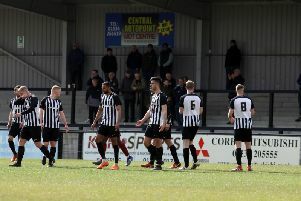 In a season that, at best, can be described as up and down for Corby Town, the winger has been the shining light. The seeds had already been sown for a big season and Crawford delivered. A high work-rate, bundles of energy, an eye for goal and the capability to produce a wonder-strike or two all added up to make him Corby’s star performer during the season. There’s no question that supporters will always find it easier to relate to one of their own and that is what Crawford is. He’s a Corby boy who clearly loves playing for his hometown team. The ability is clear and the hard work is there to back it up. He turned 21 during the season so time is firmly on his side and his impact in the Evo-Stik League South was summed up as he was named the Young Player of the Year in the division. The Steelmen will, no doubt, be doing all they can to ensure they keep hold of their young starlet. But if he continues on his current path, there can be no doubt that bigger and better things lie ahead for him in the future.